"I was thoroughly impressed with the professionalism and customer service. Techs like those gentlemen are the reason I would recommend Fireline to other companies." "Your willingness at the start of the project to work with us and develop a strategy for success was an important step, which set the tone for the relationship….Fireline folks clearly see the big picture." You deserve to get the best protection for your business. Let the experts at Fireline help you to find the right solution for your needs. Fireline can provide your company with every form of fire protection in every stage – from design to installation to inspection and repairs, Fireline has you covered. The Fireline Corporation is a Maryland corporation founded in 1947 by John S. Waters. As a pioneer in the fledgling fire equipment distribution business, John Waters soon saw the benefits of offering exemplary service and high quality products at a fair price. Fireline has lived by this standard for more than 70 years and the tradition continues today. A family business now in its third generation, Fireline is embracing new technologies, while holding true to the values and quality practices that have kept the company successful throughout the years. Fireline serves the Baltimore, Washington DC and Northern Virginia markets and has expanded both its territory and its portfolio of equipment and services. Fireline proudly offers the industry’s highest quality brands such as Notifier, Amerex, Kidde, Ansul, and Vesda. Factory trained technicians are available 24 hours a day, 7 days a week. NICET certified designers and staff ensure the highest quality standards are held within the company. Fireline’s services include, equipment sales, design, installation, inspection, and repair. The Waters family has always believed in the importance of supporting both the company and the industry. In order to give back to the industry, all three generations of Fireline Presidents have served, or currently serve, on boards and committees for various industry trade associations as well as the advisory councils for Fireline’s many manufacturers. These organizations include the National Association of Fire Equipment Distributors (NAFED), the Fire Suppression Systems Association (FSSA), the Life Safety Alliance (LSA), the Environmental Protection Agency (EPA), and the Automatic Fire Alarm Association (AFAA). Fireline also ensures that all its practices meet the codes and standards of the National Fire Protection Association (NFPA). 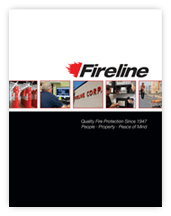 Fireline stays focused on its company vision: To be the regional leader in fire protection equipment, sales, installation and service; known for our exemplary quality and reliability as well as our company-wide recognition of the critical importance of protecting life and property for our customers and communities.